Manpreet Manchanda commutes some 25 km daily, from his home in South Delhi to his office in Gurgaon, just across the Haryana border. On alternate days, the 32-year-old marketing professional buys petrol worth Rs 500 at the pump near his house. At slightly over Rs 58 a litre, he got 8.6 litres in March, when he bought his Maruti Alto. With petrol at Rs 66.42 a litre now, Rs 500 fetches him 13 per cent less. Manchanda buys the government's logic that petrol prices have risen because global crude prices are up and the rupee is down against the dollar. But the fact is that taxes on oil and gas products in India are among the world's highest. Of the Rs 66.42 that Manchanda pays for a litre, Rs 25.92 is taxes and duties, of which Rs 14.78 goes to the Centre. Elsewhere, things are worse: a litre of petrol costs Rs 74.04 in Punjab and Rs 74.36 in Karnataka. In Delhi, besides central excise and cess, which account for more than one-fifth the price of a litre of petrol, the local government levies 20 per cent value-added tax, or VAT. In states such as Tamil Nadu, Andhra Pradesh, Karnataka and Punjab, VAT exceeds 28 per cent. 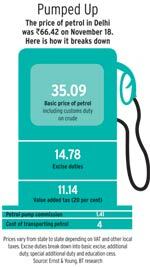 Petrol costs more in India than in most of the world. It is costlier in parts of Europe, but there it has an octane rating of 91 to 97, which means it is superior to Indian petrol, which typically has a rating of 85. At current exchange rates, Filipinos pay Rs 64.27 per litre, Bangladeshis Rs 48.07, Pakistanis Rs 44.53, and Chinese Rs 37.31. Taxes are a sensitive issue for the government. 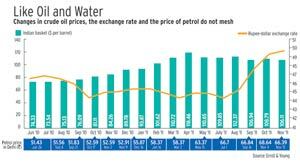 It decontrolled the petrol price as recommended by the committee led by energy expert Kirit Parikh in June last year. But it ignored the recommendations to rationalise taxes. On November 15 this year, oil marketing companies cut the price of petrol by Rs 1.86 (without state taxes) per litre. The price was raised 13 times since decontrol was announced, but this was the first cut. The timing of price changes seems political, not economic. For instance, there was no drop in the price of the Indian oil basket, nor a rupee appreciation, that prompted the November 15 price cut. Those knowledgeable about the reduction say it was likely prompted by pressure on the United Progressive Alliance government from its allies. After decontrol was announced in June 2010, three months passed before oil marketing companies raised petrol prices. They waited for the monsoon session of Parliament to end, and raised the price by Rs 1.13, avoiding discussion on the issue. In the first five months of 2011, the price was not raised despite rising prices of the Indian crude basket. The global price of crude jumped from US $93.33 a barrel in January to $118.46 in April. Oil marketing companies were bleeding, but it was May before they were allowed to raise prices. Critics say the Union government is influencing the decisions of oil marketing companies. "The government wants to be player and umpire," says an official with a privately owned oil marketing company. The Rs 5 increase in May this year came a day after elections ended in West Bengal, Tamil Nadu and elsewhere. "We did not raise the price of petrol earlier, as the board of directors thought consumers were not ready for it," said R.S. Butola, Chairman and Managing Director of IndianOil, after the price hike. Few bought this logic. Political considerations appear to be throwing the government's price decontrol experiment off course. Parikh says the government has begun to let oil marketing companies work out prices based on market considerations, and adds that this should become a continuous process. "It should be a routine matter for the consumers," he says. "They should not be bothered by small increases or decreases." In Australia and the United States, auto fuel prices are not controlled. Retail outlets decide their own price based on their location and the source of the fuel. Prices are corrected on an hourly basis. Ajay Arora, oil and gas expert and Partner, Ernst & Young, says India should have a transparent formula for correction of petrol prices, perhaps fortnightly, based on economic criteria. Private oil marketing companies do review prices once a fortnight, but the petroleum ministry is opposed to the idea. Now is a good time for the government to take the plunge, says Arora, as international crude prices are looking stable at around $110 per barrel. He says the decontrolled market in the last 17 months does not reflect reality, as the market is skewed in favour of government-owned oil marketing companies. Private oil marketing companies such as Reliance Industries, Essar Oil and Shell India have been forced to close some retail outlets because they were unviable. Earlier this year, they complained to the Petroleum and Natural Gas Regulatory Board, the regulator of the downstream oil and gas sector, that their government-owned rivals act as a cartel and monopolise the retail market. "They still take decisions based on instructions from their political masters," says a senior executive at a private oil marketing company who does not want to be named. Arora says the government must give public sector oil marketing companies greater freedom to revise prices. Some private sector oil executives concede that recent decisions of government companies do reflect market realities. S. Thangapandian, CEO, Marketing, Essar Oil, says the government's price revisions have helped align Indian prices with global ones, and are partly why petrol sales at his company's 1,380 retail outlets rose more than 125 per cent in the second quarter of 2011/12. But like others in the private sector, he says he is not confident the government will continue to be guided by market considerations. Another private sector oil executive, who wishes to remain anonymous, says: "I doubt the government would allow a price rise if crude reached $150 per barrel and elections were around the corner." Neither the states nor the Centre are willing to reduce their share of taxes on petrol, which accounts for 10 per cent of the auto fuels segment and is a major revenue earner for the Union government. The central revenue department estimates the government will earn Rs 1.5 trillion (one trillion is 100,000 crore) from excise and customs duties on hydrocarbon products. Additionally, it expects the states will net a total of Rs 1 trillion in VAT and other local taxes. Finance ministry officials say they have asked the states to reduce taxes, but state finance ministers say they cannot afford to do this. Finance ministry officials privately concede that it is unfair to expect states to reduce taxes while the Centre keeps its rates high. To rationalise the price of petrol, Ernst & Young's Arora says the central government should structure it so that the tax component is fixed and does not fluctuate with volatile crude oil prices. The states' share of taxes, which is a percentage of the 'refinery gate price', fluctuates with every change in oil prices. Rajeev Jain, Patron of the Delhi Petrol Pump Dealers' Association, says that if petrol and diesel are included in the Goods and Services Tax, it would make pricing more uniform and stable, and level the playing field, but some state governments oppose the idea. Anis Chakravarty, economist at Deloitte Haskins & Sells, says the government can not afford to sacrifice petrol revenues, because it would then be forced to cut back on social programmes for food, education and employment. He differs with economists who say that petrol prices do not have a multiplier effect on the economy. "The ground reality seems different," he says. He suggests that India forget about reducing its budget deficit to 4.6 per cent of the gross domestic product. "Right now, even five per cent looks hard to reach," he says. He says the target should be more realistic. Some argue that if oil marketing companies improve refinery margins, they would have more leeway with prices. "I am sure that if companies did this, they would be able to pass on the benefit to consumers," says Deepak Mahurkar, Associate Director, Pricewaterhouse-Coopers. For now, though, it looks as though the companies and government are caught between a rock and a hard place.